Hindu women pray in the Old Brahmaputra River in central Bangladesh at the start of an annual 2-day religious ceremony. 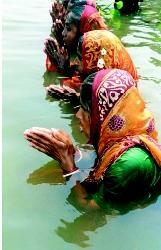 Hindus believe that bathing in the waters of a holy river, such as the Brahmaputra in Bangladesh and the Ganges in India, will purify one's life of past sins. Water is an element common to many accounts of the creation of the world and its inhabitants. It may be underground, may surround the Earth, or may be deep, dark, and chaotic—a lifeless, mysterious abyss from which life emerges. In some accounts, the creator remains independent; in others, the creator is part of the waters. Water may even be the tangible representation of the divine. It may signify nothingness, contain some substance from which the Earth or life is created, or have spontaneous life-generating power of its own. Many variations exist. In the Judeo-Christian tradition, the spirit or breath of God moves on the face of the waters (Genesis 1:2) and sets into motion the divine creation of life over the next 6 days. The Koran tells Muslims how "we have created every living thing from water." According to the Hindu Rig-Veda, "in the beginning everything was like the sea and without light." Water ( jal ) is one of the five great elements for Hindu meditation and ritual; it carries a divine egg or seed from which the god Brahma is born. The Earth is raised from the waters by Brahma and, in later accounts, Vishnu, from whose navel grows a lotus (water lily) in which Brahma is carried. Water and lotus are important Buddhist symbols. American Indians believe that breath, wind (thought), and water connect all living things. To the Iroquois, diving animals brought mud from the depths to create the world. In the Inuit tradition, seals, walrus, and whales came from the fingers of Sedna, who lived beneath the sea. The idea of a firmament separating upper (heaven) from lower (Earth) waters appears in many religions. The sky may be a solid dome over the Earth dividing the primeval waters. Those above fall to Earth as rain "through the windows of Heaven," while the Earth rests on the waters below, from whence it emerged. Rivers and lakes may separate the world of the living from the dead. Water, flowing downward, symbolizes the transmission of wisdom from on high. Every continent has religious accounts of floods. In the Old Testament of the Bible, Noah builds an ark to brave the storm (40 days and 40 nights) that God is sending to punish human wickedness. To the Sumerians, the flood was a result from fighting among the Gods. Aztec and Maya peoples believed that flooding separated successive eras. Persian texts speak of millennial floods covering the world. 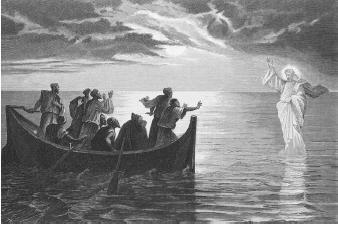 The deity may have divine power over water, as in Judeo-Christian accounts of God parting the Red Sea (Exodus 14:16–22) or of Jesus calming the waves on the Sea of Galilee (Mark 4:37–41). Water plays a key role in the Judeo-Christian religion. This nineteenth-century illustration depicts Jesus Christ walking on water, a miracle described in Matthew 14:25 of the Bible. Water is associated with cleansing and purification of body and spirit. For Christians, baptism by water—itself a symbol of the grace of God—signifies spiritual rebirth. The word "baptism" comes from the Greek word meaning to plunge or to wash.
Integral to Hindu religious practice are pure and sacred rivers, most notably the Ganges, which comes directly from a holy source in the Himalayas. Immersion in the Ganges is said to bring believers purification and freedom from sin. Buddhists seek spiritual transformation (nirvana) in natural settings—amid forests, rivers, and mountains—and see the entire universe—humans, animals, water, earth, sun, moon, and stars—as an interdependent whole. Sacred healing rivers and wells abound, often with Celtic origins (such as Chartres, the Chalice Well at Glastonbury, England) or miraculous events (such as a vision of the Virgin Mary at Lourdes grotto in France; see sidebar). The search for the sacred Fountain of Youth launched Spanish explorer Juan Ponce de Leon (1460–1521) on his expedition to the Americas. Today, are people far removed from such beliefs? Consider the fact that some people toss coins into wishing wells or fountains for luck. What role does religion play today in humanity's care of water? The World Scientists' Warning to Humanity calls on the help of the world's religious leaders in resolving critical environmental stress regarding water resources and oceans. The World Council of Churches' "Justice, Peace, Creation" campaign is particularly concerned with ecology and climate change. Leaders from the world's religious communities met at the United Nations in 2000 and signed the "Commitment to Global Peace," which included a call for the protection of the environment for present and future generations. Among other national-scale religion-based environmental and water-related advocacy groups are the National Religious Partnership for the Environment. In summary, as people face the challenge of sustaining the world's water today and for the future, religion continues to play an increasingly recognized ethical and practical role. SEE ALSO Arts, Water in the ; Ethics and Professionalism. Dwivedi, O. P, ed. World Religions and the Environment. New Delhi, India: Gitanjali,1989. Rudhardt, Jean. "Water." In Encyclopedia of Religion, ed. Mircea Eliade. New York:Macmillan, 1987. Forum on Religion and Ecology. Harvard University. <http://environment.harvard.edu/religion> . Hallman, David G. Globalization and Climate Change. World Council of Churches. <http://www.wcc-coe.org/wcc/what/jpc/climate.html> . National Religious Partnership for the Environment. <http://www.nrpe.org> . Resources on Ecology and Religion for Individuals and Congregations. Web of Creation. <http://www.webofcreation.org> . Each year, thousands of people make a pilgrimage to Lourdes, France, in search of a cure for what ails them. Lourdes is well known for its spring water, which is said to heal the sick. The story of Lourdes holy water dates back to the mid-1850s when 14-year-old Bernadette Soubiroux claims to have seen an apparition of the Virgin Mary eighteen times. Eventually a church was constructed at the site. Since then, people have claimed to be miraculously healed by the spring waters—apparent cures not proven scientifically but no less convincing to believers.